Muslim women are dubbed as extremist or oppressed when, following their religion, they modestly cover their bodies, while for Jew women it is said to be their religious duty or gentleness. Why this double game or hypocrisy of the Americans and Europeans ? Not only that, some countries have banned wearing of modest clothing by Muslim women while in other counties they are teased / harassed if wearing modest clothes. This is the true face so-called human-rights-living / liberal society of Europe and USA. Just in case if you think that Muslims are the only one who wears Burqa. 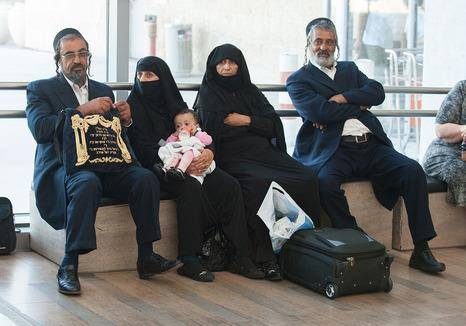 Here is Haredi burka Jewish sect that observe more stricter Veil than Muslims. Orthodox Jewish women have always felt proud wearing modest dresses. Now, in some Orthodox Jewish sects, women have gone to a new level of modesty by covering their whole body and face. Many of these families dress their young girls of all ages with the same full dress garb, except for the face veil. This modest Orthodox Jewish sect, is concentrated mainly in Israel, in which ultra-Orthodox Jewish women feel that modesty requires covering their entire body burqa-style, including a veil that covers the face. The garment, which is more like a burka niqab, is also called frumka, a play on the word frum (Yiddish for the devotee) and the burka. This Orthodox Jewish sect, is estimated to have started out with about 100 women in 2008, and grew to several hundred in 2011. To date, there are about 30,000 women who wear shawls, according to Rabbi David Benizri. The group mainly resides in the city of Beit Shemesh. “This dress code was adopted due to concerns about the state of deterioration of modesty in the ultra-Orthodox Jewish community,” Rabbi Benizri said. “The rabbi explained to us the benefits of Jewish women dressing modestly. We leave our body for our husbands and we don’t want to share our bodies with others,” Saari Rothberg, 22, who proudly wears the Jewish burqa in Beit Shemesh, Israel told YourJewishNews.com. When you are in the city of Philadelphia , look up Temple Baptist Church , with a seating capacity of 3,300. And be sure to visit Temple University, where thousands of students are educated. Bush and Blair were a couple of squalid schemers whose disgusting lies led to massive destruction and caused a staggering number of deaths in the most horrible circumstances. Neither of them has the slightest understanding of the utter misery they inflicted on millions of people. They refuse to admit that the current disaster in Iraq would not have happened had they not gone to war. They are unashamed of their lies, their folly and their slaughter. Last week the man Blair tried to justify his wicked deceit by writing that “we must liberate ourselves from the notion that ‘we’ have caused this.” He ignores the fact that he and Bush had waged an undeclared war in Iraq for years before they ordered their invasion. Not only did they impose vicious sanctions but declared ‘no-fly zones’ supposedly to protect Shias and Kurds but which were intended to destroy Iraq’s entire infrastructure. The zones had no basis in international law and complemented sanctions in a particularly savage manner. We know that foreign children don’t matter to warmongers. After all, when US ambassador to the UN Madeleine Albright was asked on television whether she considered the deaths of half a million Iraqi children a reasonable consequence of US sanctions she replied “This is a very hard choice, but we think the price is worth it.” Can you imagine any human being believing that the death of half a million kids is justifiable? The price was worth – what? The price of the US-UK war on Iraq is now being paid with staggering intensity. Thousands of people are dying in the latest phase of hideous slaughter by mindless bigoted fanatics. And it was all started by Bush and Blair. The pre-war half million dead children were only a start. Look at what has happened as a direct result of the Bush-Blair war: Iraq is not unified or democratic and is not centrally-governed. It cannot defend itself in any fashion. But it is buying vastly expensive and useless military equipment from the United States. On June 6, six days before “two divisions of Iraqi soldiers – roughly 30,000 men – simply turned and ran in the face of the assault by an insurgent force of just 800 fighters” Lockheed Martin delivered the first F-16 fighter aircraft of a contracted 36 valued at $1.9 billion. Then there are the deals for $4.8 billion for Apache attack helicopters, $2.4 billion for anti-aircraft missiles (presumably to combat the Isis air force), a paltry $800 million for 24 AT-6 Texan aircraft, and a $5 billion order for 30 Boeing 737-800s. So be assured that America will fight, fight and fight again to keep the Iraqi government going Boeing. They couldn’t produce evidence. But they did reduce Iraq to rubble. And the present catastrophe in that ruined region is entirely their fault. The liars lost their bet, but the arms manufacturers’ profits roll in. The price is worth it.